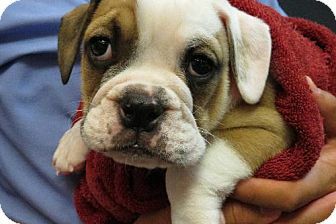 Bulldog puppies are so cute with their wrinkled little faces! 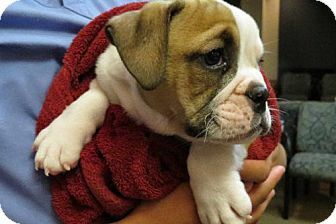 You can find Bulldog puppies and dogs for adoption across the US and Canada on Adopt-a-Pet.com here. Like Pugsley in the photo, who’s for adoption as of the posting of this article. He’s 16 weeks old, super sweet and super smush face! Finding a purebred Bulldog puppy might take a bit of searching and patience, especially one local to you. The good news is Bulldogs are super cute at any age! Plus if you adopt a young or adult Bully instead of a puppy, you’ll be more likely to know what kind of personality and health issues you’re getting, which you can’t see fully or at all in a puppy. Plus you won’t have to worry about puppy messes, puppy training, and puppy chewed up shoes! Bulldog mix puppies are super cute too! So what should you know about Bulldogs before you adopt them? First let’s talk about the breed name. Bulldog is the exact same breed as English Bulldog aka British Bulldog — the AKC uses Bulldog as the breed name, but you might see breeders and rescues using the name English Bulldog. They just different names for the same dog breed. There are three different dog breeds with “Bulldog” in the name too. 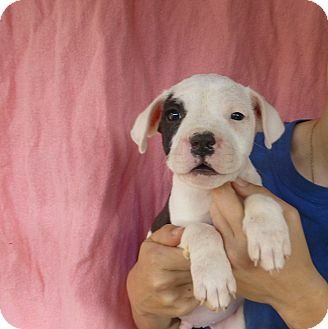 They are American Bulldog, French Bulldog, and Olde English Bulldog also spelled Olde English Bulldogge. There’s also the Boston Terrier which looks so much like the French Bulldog it can be hard to tell them apart! The American and Olde English breeds are bigger and taller than a regular Bulldog, while Frenchies and Bostons are smaller. What about Miniature Bulldog or Mini Bulldog breeds? The breed name “Miniature Bulldog” is not recognized by the AKC and so it is not officially considered a separate breed. Mini Bulldogs are either just very small Bulldogs or sometimes a mix of a Bulldog and a smaller breed dog. Colors! Bulldogs come in a wide variety of colors. You’ll find Bulldogs that are red brindle, all other colors of brindles, solid white, solid red, fawn, and piebald. Many of the Bulldog colors have patches of white too. 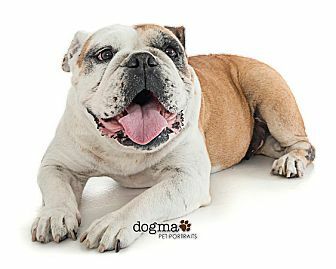 For Bulldog tips, we defer to the Bulldog experts for information about personalities, training, and health: Bulldog Rescues! Even if you buy a purebred Bulldog puppy from a breeder, you can benefit from the knowledge that Bulldog Rescues have learned from helping so many abandoned Bulldogs, so that you can keep your Bulldog happy and healthy for their entire life. Thanks to Love a bull English Bulldog Rescue www.arizonabulldogs.com for letting us share their excellent article “What you need to know about rescue bulldogs” which we’ve reprinted below! Rosie is an adult Bulldog for adoption in California. Please read entire article before considering adoption. Before you apply to adopt a Bulldog…. A Bulldog may not be the right choice for every family. Living with a Bulldog can be very rewarding, but you must be committed to meeting the Bulldog’s particular needs. They are, in my opinion, the greatest dog in the world! (I am bias!) With that said, they are a lot more work than other breeds of dogs. They want to be with you all the time. They are wonderful companions, but if you do not have the time to dedicate to a bulldog, do not apply to adopt. Remember: these dogs are rescue dogs. They are going to need extra special care. Bulldogs are perpetual children: they never grow up. A Bulldog does best in a loving environment, free from fear and neglect. They are happiest when with people and require lots of attention from people. When left alone, Bulldogs can be very destructive. They may chew throughout their lifetimes. They may need to be crated when they are not being supervised. A Bulldog should never be left unattended in your backyard. 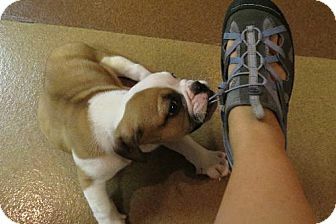 Not only is it dangerous to your Bulldog’s wellbeing, but Bulldogs are often targeted for theft. Please keep in mind that rescued Bulldogs are not always happy, healthy or well adjusted. If you are considering adopting a rescue it should be because you are committed to giving a homeless dog a second chance.This means having the time and patience to work with social, emotional and behavioral problems. In some cases, a health issue is present. Many rescued Bulldogs don’t get along with other animals and some can’t be placed with children. If you’re seeking a rescue as a way to obtain a cheap Bulldog, you’ve come to the wrong place. You must be passionate about the breed to accept what baggage comes along. Also, rescue is not the place to be looking for a puppy. We rarely get in dogs under 2 years of age. IF YOU ARE WANTING A HEALTHY, YOUNG BULLDOG, YOUR WAIT WILL BE A LONG ONE. There is a limit to how much strenuous physical activity a typical Bulldog can safely tolerate. Their short muzzles and narrow windpipes, relative to the size of their bodies, limits their oxygen intake and causes them to become easily winded. This can result in acute respiratory distress and sometimes death. Like it or not, most Bulldogs do not have great physical endurance. They are more like short-distance sprinters than long-distance runners. Bulldogs don’t realize this; your own common sense must prevail. Although all Bulldogs that we place are subjected to a thorough veterinary examination and are evaluated for soundness of temperament, we do not guarantee that they will not have any problems in their new homes. In fact, a period of adjustment is expected during which the Bulldog and the new owner will be getting acquainted with each other, and the Bulldog will be “settling in” to a new routine. Most rescues will have potty training issues in their new home. You have to be ready to deal with that. I will be more than happy to discuss what works for me, but you have to know that there will be accidents. If we have any doubts about a Bulldog’s ability to deal with certain situations, we put restrictions on the type of home in which it will be placed (for example, by requiring no young children and/or no other pets.) We also provide guidelines for the new owners to ensure that they are aware of any special treatment the Bulldog may require. With the application of a little common sense in following the guidelines, new owners will find the transition into owning a rescue Bulldog to be relatively simple. You may have heard Bulldogs do not swim. You are right. I cannot tell you how many people I have known or heard of who have lost their beloved bullys in a pool. Just like children, most bulldogs love to swim. They will jump right in before you know it. They sink like an anchor. This is why at rescue, we do not adopt to homes with unfenced pools. There are NO EXCEPTIONS. When selecting a pet, the most important breed characteristic to consider by far is its temperament or disposition. Failure to thoroughly investigate temperament is the biggest mistake anyone can make in selecting a pet, especially a Bulldog.In my experience, far too many people select a dog based solely on its physical appearance, and those who do so usually live to regret it. People who shop for a pet the same way they shop for a new car, a piece of furniture or designer jeans should never own one. If it is a status symbol you want, please do not even consider adopting a Bulldog! Even though I have a page on this site showing all of the famous bullys, in no way, shape or form is that to encourage getting a bulldog based on the fact they are popular. I did that page for fun only. If you are looking for a status symbol, you and the dog are sure to be disappointed in each other. For one thing, the modern Bulldog cannot tolerate isolation. Some breeds are able to thrive on only occasional human contact, but Bulldogs simply cannot stand to be ignored. They crave attention, and they will do almost anything to get it. Especially that these are RESCUE dogs, they need more TLC from their humans. It is nearly impossible to lavish too much love and attention on a Bulldog – and only he decides when he has had enough of it. When he has had enough loving, he will finally wander off somewhere to find peace and quiet. If you’re not a hands-on type of dog lover who enjoys close and frequent contact and a few wet kisses, a less affectionate pet may better satisfy your needs. The Bulldog’s constant craving for attention and the need to entertain humans and be entertained by them is not for everyone. Bulldogs do not respond obediently to heavy-handed physical discipline. Despite 1000 years of selective breeding, most Bulldogs I am familiar with, both male and female, instinctively detest and resist violence or the threat of it. This is especially evident with regard to children. A screaming child immediately causes grave concern and routinely triggers a decidedly protective response. They seem to sense trouble, and they are likely to intervene in their own special way to end the disturbance. Modern Bulldogs are not by nature good guard dogs or attack dogs. However they are fairly reliable watchdogs. They will normally alert you to any unusual activity in the home or yard. — Thank you Karen for letting Adopt-a-Pet.com reprint your article here! Ready to adopt a Bulldog? Find Bulldogs for adoption near you using Adopt-a-Pet.com.